Elma Joyce Painter Smith, age 89 of Petersburg, WV passed away on Tuesday, May 22, 2018 at her home. She was born September 7, 1928 in Akron, Ohio and was the daughter of the late Alonzo Day Painter and Virginia Katherine Lehman Painter. She was also preceded in death by her husband, Carl D. Smith, two brothers, Romeo Painter and Wayne Painter and two sisters, Amelia Young and Jerolee Harris. She is survived by two daughters, Sharon L. Smith of Petersburg, WV and Laura J. Wilson and her husband, Kirk Wilson and two grandsons, Derek Wilson of Arlington, VA and Jonathan Wilson of Winchester, VA; one brother, Frederick D. Painter of Grapeland, Texas. Mrs. Smith graduated from Shepherd College, Shepherdstown, WV with a BA degree in Elementary Education. She was employed by the Grant County Board of Education as a Classroom teacher for nearly 40 years. 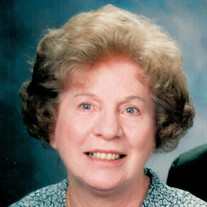 She was a member of the Christ Central Community Church. Family will receive friends on Saturday, May 26, 2018 from 6-8 p.m. at the Schaeffer Funeral Home in Petersburg. Funeral service will be held on Sunday, May 27, 2018 at 2 p.m. at the Schaeffer Funeral Home Chapel with Pastor Sam Harper and Pastor Craig Howard officiating. Interment will follow in the Lahmansville Cemetery. In lieu of flowers memorials may be made to Grant County Association of Retired School Employees Scholarship Fund, 5294 Patterson Creek Road, Lahmansville, WV 26731 or Gideons International or Charity of Choice.